From the day trips to extended interior trips, we have the right canoe for you! Please see our helpful guide below for canoe weights, lengths and rates on the models we carry. 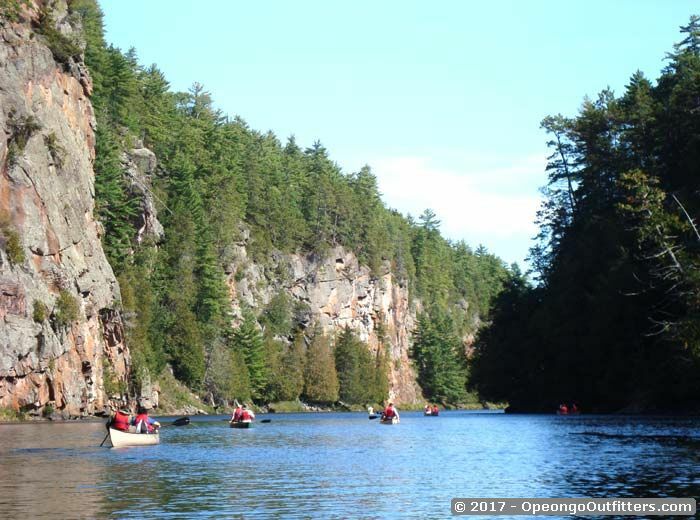 NOTE: Each canoe rented includes two paddles and two lifejackets, at no extra charge. All Kevlar canoes come with deep dish carrying yokes. All rentals are based on calendar days, not 24 hours. Campsite canoe delivery is based on 24 hour rate. Rental taken after 2:00 pm or returned before noon qualify for half day rate. After the 3 day minimum, there is no half day rate available for complete outfitting. Canoe & equipment can be picked up the night before your trip so you can get an early start at no extra charge. By Advance Arrangement Only. All rental rates are in Canadian funds & do not include taxes. All Taxes are Extra. 16ft 3 seat fibreglass 68lb. 16ft or 17ft Feather weight 42lb. 18.5ft 3 seat feather weight 49lb.